7600 Foundation Advocates and Club Foundation Chairs please attend to the following during this last couple of months of the 2014-2015 Rotary year. Central. For those clubs who are more than 30% short of their goal please contact them find out how they intend to meet their goals and report that information back to Carol Woodward by May 15 at woodwardcd@aol.com or 804-691-8486. ** Check the status of each Club’s completion of 2015 -2016 Giving Goals. Have these goals been entered by the President –Elect or Club Foundation Chair in Rotary Club Central? Please report back to Carol Woodward by May 15. 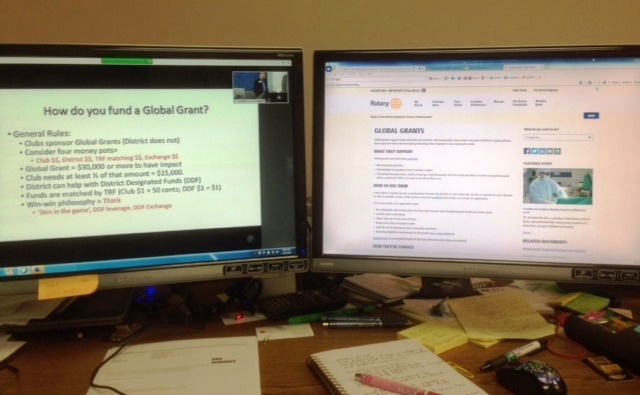 Webinar News: On Saturday April 18 the District Rotary Foundation Committee conducted its first ever webinar training when it did so for the second session of the Grants Management Seminar. Dana Rieves was one of the webinar attendees and submitted this photograph of her desktop display(s).